Frugal Fall DIY: Fall Scrap Fabric Garland. Garlands seem to be the trend as people are looking for fun ways to add a pop of color to their homes. If you have ever wanted a garland of your own to display but were not sure where to start, this simple DIY Fall Garland is it. This frugal fall garland does not require any sewing, and you can use scrap fabric you already have around the house. If you don’t have any scrap fabric, you can always grab some from your local craft store in the bargain bin. In just a short amount of time you can create your own scrap fabric fall garland that you can be proud of! 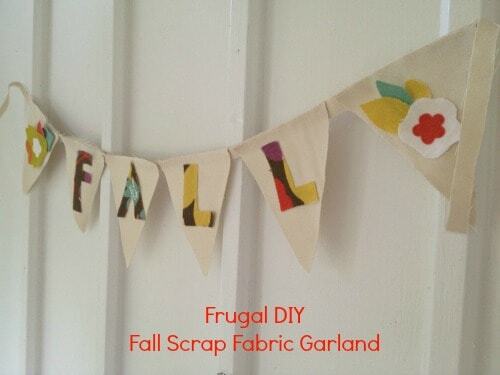 Can you believe four items are all you need to make this Frugal DIY: Fall Scrap Fabric Garland? Now let’s get started. Find a nice and open work space that you can use to lay your supplies out and get crafting. 1. Begin by cutting triangle out of the solid color fabric. You can free hand these or use a stencil cut out of cardboard. For each letter in the word you wish to spell, you will want one triangle. Add two additional triangles to use as end pieces. 2. Now, cut out the letters of the word you are spelling into the colored or patterned fabric. You can freehand these as we have in this sample photo. Is it a lot easier than you may think. You can also cut out a few shapes or flowers to use on the end pieces as we have here. 3. For the strip that will hold the triangles, cut a strip of fabric that is about one inch thick and three feet long. 4. Begin assembling the garland by placing a strip of hot glue along the back top of the triangle. Press the triangle to the long strip. Press firmly into place until the piece is adhered well. 6. Add some embellishments onto the end pieces to complete the piece. That’s it! You can now hang the garland from a fireplace, entryway, staircase or anywhere else you choose. It adds the perfect touch of fall color and of course fall charm. Looking for other Frugal Fall Decor? Check out this Repurposed Sweater Vase!